Researchers at the University of New Hampshire have captured a difficult-to-view singular event involving "magnetic reconnection"—the process by which sparse particles and energy around Earth collide producing a quick but mighty explosion—in the Earth's magnetotail, the magnetic environment that trails behind the planet. Magnetic reconnection has remained a bit of a mystery to scientists. They know it exists and have documented the effects that the energy explosions can have—sparking auroras and possibly wreaking havoc on power grids in the case of extremely large events—but they haven't completely understood the details. In a study published in the journal Science, the scientists outline the first views of the critical details of how this energy conversion process works in the Earth's magnetotail. 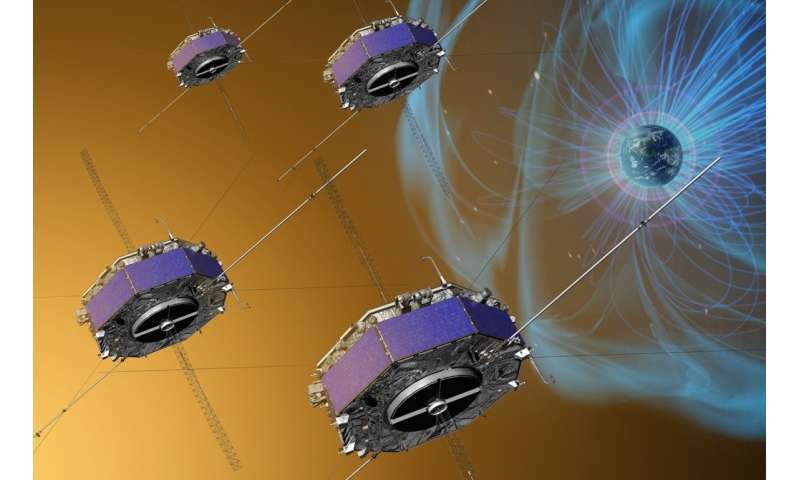 "This was a remarkable event," said Roy Torbert of the Space Science Center at UNH and deputy principal investigator for NASA's Magnetospheric Multiscale mission, or MMS. "We have long known that it occurs in two types of regimes: asymmetric and symmetric but this is the first time we have seen a symmetric process." Magnetic reconnection occurs around Earth every day due to magnetic field lines twisting and reconnecting. It happens in different ways in different places, with different effects. Particles in highly ionized gases, called plasmas, can be converted and cause a single powerful explosion, just a fraction of a second long, that can lead to strong streams of electrons flying away at supersonic speeds. The view, which was detected as part of the scientists' work on the MMS mission, had enough resolution to reveal its differences from other reconnection regimes around the planet like the asymmetric process found in the magnetopause around Earth which is closer to the sun. "This is important because the more we know and understand about these reconnections," said Torbert, "the more we can prepare for extreme events that are possible from reconnections around the Earth or anywhere in the universe." Magnetic reconnection also happens on the sun and across the universe—in all cases forcefully shooting out particles and driving much of the change we see in dynamic space environments—so learning about it around Earth also helps us understand reconnection in other places in the universe which cannot be reached by spacecraft. The more we understand about different types of magnetic reconnection, the more we can piece together what such explosions might look like elsewhere. For the first reported asymmetrical event on October 16, 2015, and now this symmetrical event on July 11, 2017, NASA's MMS mission made history by flying through magnetic reconnection events near the Earth. The four MMS spacecrafts launched from a single rocket were only inside the events for a few seconds, but the instruments which UNH researchers helped to develop were able to gather data at an unprecedented speed of one hundred times faster than ever before. As a result, for the first time, scientists could track the way the magnetic fields changed, new electric fields presented, as well as the speeds and direction of the various charged particles.